Initially introduced in 1990, the Spyderco Endura offered a lightweight, easy to use and extremely affordable pocketknife that has undergone constant improvement and fine tuning revisions since its initial release. The comfort, durability and entry level pricing offered by the Endura makes it one of Spyderco’s most popular and best selling models. Because of the immense popularity of the Endura, it is one of the models that Spyderco has marked for CQI: Constant Quality Improvement. 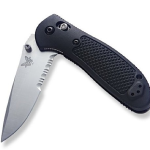 Since its debut, the Endura has remained in constant production for almost 25 years, but has also undergone slight quality changes over the decades to make it a more durable and dependable pocketknife. Today, the Endura is in its most recent incarnation as the Endura 4. 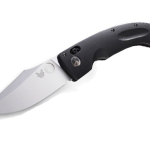 Spyderco’s unique and distinctive handle shape for the Endura 4 is well known among users for its supremely ergonomic design and its comfortable and stable hand feel. 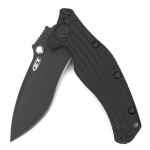 Although the Spyderco Endura can be ordered with many different handle options depending on your preference for weight, texture and feel, the Endura model comes standard with a black fiberglass reinforced nylon handle. Although fiberglass reinforced nylon is commonly considered to be a fairly low end handle material, it is lightweight and durable, and Spyderco has taken many considerations to elevate the handle of their flagship model into a useful and reliable grip. Recent updates to the Endura 4 include the addition of a bi-directional texture that provides a reliable and non-slip grip that allows you to hold the knife any way you want with confidence and still get the benefit of the non-slip texture. 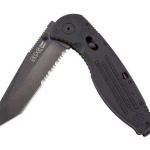 A great deal of thought, planning and engineering went into making the Endura handle an ergonomic fit for just about any hand size or shape, and many users consider it to be one of the best pocketknife handles available. The Spyderco Endura comes with many different blade options, including various high-performing blade steel choices and grind options. The VG-10 blade steel version is the most basic model, and also one of the most popular and versatile; VG-10 steel is a strong and durable mid-range blade steel that is easy to sharpen and fairly good at maintaining an edge. The Endura is also made in a model that uses ZDP-189 steel. While this steel is better at maintaining an edge, it is notoriously difficult to sharpen on your own, and often requires the skills of a professional knife sharpener. The current standard blade for the Endura 4 features a saber grind instead of a full flat grind, which makes the blade slightly thicker and more durable, although it is still not designed for prying and could potentially warp if used extensively for prying. 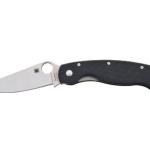 The blade locking mechanism on the Spyderco Endura is a simple mid-lock system that also includes a Boye dent to prevent you from accidentally releasing the lock during use, even if you put extreme pressure on the handle. Despite negative reviews regarding the mid-lock system, the mechanism is proven to be reliable and fail-proof. The Endura’s blade also has just enough of a tang to ride up against your fingers and prevent guillotining even if the lock does fail during use. The Endura includes several special features to make it easier, safer and more convenient to use. The Endura 4 update includes a simple screw construction to allow you to completely take the knife apart and remove the handle for easy cleaning and maintenance. Some users even replace the handle with different materials for different performance qualities or a more appealing aesthetic appearance. Safety features added to the Endura 4 update include slip resistant jimping on the spine, just behind the thumb hole to add a little extra confidence and control to your thrust. Like all Spyderco folding pocket knives, the Endura features Spyderco’s signature Spyderhole thumb ring for more smooth and easy one-handed opening action. In addition to making a one-handed open infinitely safer and smoother, this ring can also be attached to a lanyard or key ring for easy storage options. The Endura also offers a pocket clip to secure it in a trouser or breast pocket, and the pocket clip is also easily removable if you prefer to use the knife without it. The lightweight build and carefully engineered ergonomics make the Endura one of the lightest and most dependable knives in its class.